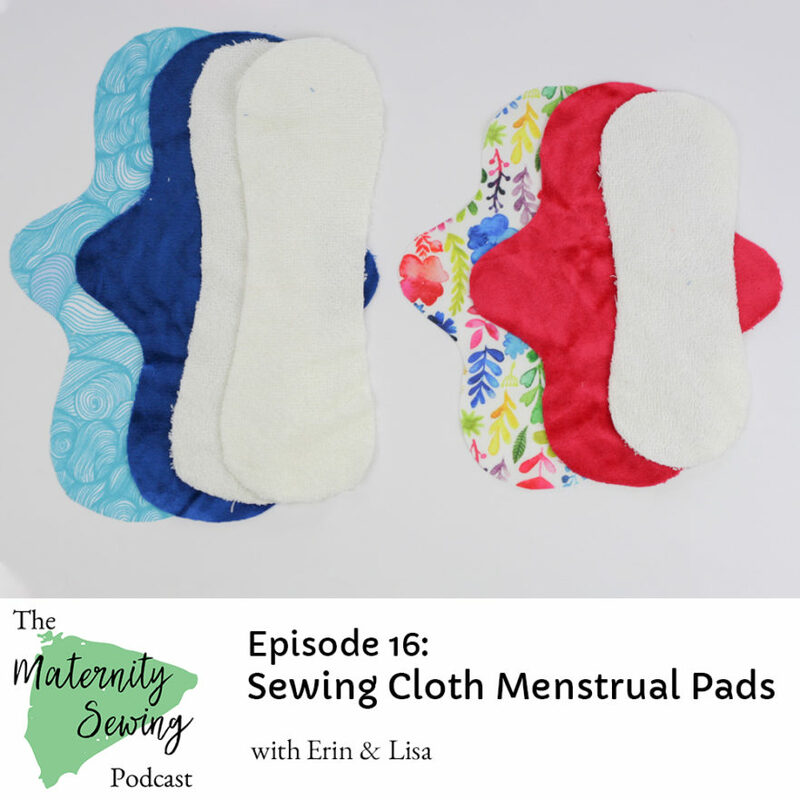 Lisa introduces Erin to cloth menstrual pads and explains how to sew them, how she was introduced to them, and why she recommends using them for all situations from menstruation, to discharge during pregnancy, to postpartum incontinence. 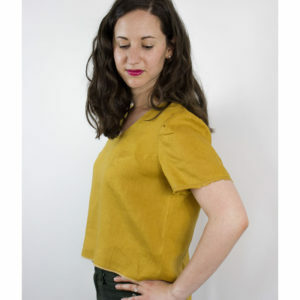 You can find Maternity Sewing at MaternitySewing.com. Keep in touch with us by following our blog (follow by RSS or followin Bloglovin), following us on Instagram, or liking our Facebook Page. Find friendship and community with other sewists going through pregnancy, nursing, and postpartum life in our Facebook Group. [0:27] postpartum life and body positivity. Hi I’m Lisa Kievits and I’m Erin Weisbart and we’re the owners of maternity sewing.com. Today in the maternity sewing podcast Lisa introduces us to cloth menstrual pads. She talks about her experience sewing and wearing them and gives us some information to help you decide if they’re right for you too. [1:00] Hey Lisa how’s it going? Hi Erin. How are you? So today we’re going to talk about cloth menstrual pads which I haven’t ever actually used so you’re going to be the expert in this episode. So can you start by just explaining what are cloth menstrual pads? Yeah of course. They are basically the same as the sanitary pads that you buy in supermarket, just the regular ones, made like the white ones that are I think are kind of like mini diapers basically. The difference is that they are made from fabric and that they are reusable so you can buy them, or you can make them yourself and the difference is that you don’t throw them away but you wash them so you can use them again in your next period. [1:54] So so you use cloth pads? Yeah I do for yourself? How did you get into that? Well the first time was really funny because I was when I was traveling I was in Italy and I had my sewing machine with me. There was a woman there who wanted to learn how to sew and so I was really excited about that. I always feel like you should start with something to sew something that you’re excited about too, no matter if you’re just starting out. [2:30] You know. So I asked her “what do you want to sew?” and she was like “cloth pads”. I was like what? It was really, I mean I knew that they existed but it was such a was such a funny request to me that and I was like “sure why not? You know I’m I’m going to look into this and then see what they’re all about and see if I can find a pattern for you and then stuff like that.” And so she did. So she we we found some fabric it was not actually the right fabric to use for them but I didn’t know that at the time. And she made a couple and she was so happy with them and it was, like during that process of teaching her how to sew with cloth pads I got more used to the idea. Also the way she was talking about it and how she was just assuming that it was it was really normal to make your own cloth pads and to be involved in doing that and to wash them and to be more confronted with your period. [4:51] but you’re still throwing something away. I tried menstrual cups before, well I tried one and I liked it but it for some reason for me it worked well the first day or two but then it would start leaking after that and I don’t know if and I don’t know why. I never really spent the time figuring out why I just kind of. menstrual cups come in multiple sizes and you need to get a different one after you’ve given birth. And so it’s been on my list as like yeah I really would like to actually find an alternative to using disposable things, but I’ve never quite gotten around to getting a new menstrual cup and I’ve never quite gotten around to sewing my own pads, so I’m really interested to. I should I should do that. I’m interested to hear more. So what do you actually need to sew your own pads? Well you don’t need much so that’s that’s a nice thing and so it’s a pretty quick project. The fabric that you use is a bit different. I mean In terms of skills as I said you don’t even need to be an advanced sewist to make them. It’s just you can you can start sewing them even if you’ve never sewn before They are a bit tricky with all the curves and everything but there are also patterns that don’t have so many curves. [8:03] is one of the most important features if you want a leak free pad because especially f you come from store-bought pads you’re used to not leaking through them of course. So you don’t want that in your in your homemade pads. [8:21] And then for the core. So there is a bottom layer, a core, and a top layer and for the core you can use any absorbent fabric that you have on hand. So it could be just cotton towels or bamboo towels or something, just something that absorbs moisture. It could be an old flannel shirt even. [8:40] And then for the top layer, that’s the layer that that goes against your skin so that’s a layer that you want to be a bit softer and I prefer natural fabrics. So cotton or bamboo or other natural fabrics they breathe better than synthetic fibers. I’ve seen also a lot of people use minky but I am not really a fan of that because it’s synthetic. [9:21] And so that’s basically what the pad consists of so that’s you just sew these three layers together and then you add some snaps so you can snap them in your underwear. [9:33] And that’s it really. That doesn’t actually sound that hard. No it is it’s not hard at all and it’s just you just need to if you have the right if you find the right websites where to find the supplies it’s very easy and they don’t take up a lot of lot of fabric so you can use scraps for them as well. You can also make if you have like cotton scraps you can just make the the top layer from the cotton scraps you have that laying around. [10:00] Yeah they’re kind of a fun project in between and once you have figured out what you like best, it’s really easy just to sew a couple here and there. And then I’ve also seen people get really addicted to them like they want they have like a giant ginormous collection of all kinds of prints and fabrics and whatever. So that’s that’s something that can happen to you can kind of get addicted. So if somebody wanted to start sewing their own cloth pads where where would you tell them to start? What resources would you point them toward? [10:39] Yeah I would say that Etsy is a good way of a good like a good source to find both ready-made paths and patterns and fabric as well. 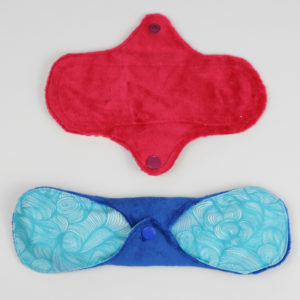 Somehow there does seem to be a lot of shops on Etsy who sell them so if you want to try to like try them first before you start making them you can just buy ready-made pads just so handmade by someone else basically. And then there is also a Facebook there’s also a bunch of Facebook communities that are really active where people exchange ideas and show off what they’re making and what kind of patterns they are using. if you don’t know it exists you know you don’t encounter it that easily. But it’s nice because people also talk about the empowerment they feel through body knowledge basically. So they get more knowledgeable about their period. And they stop feeling they stop feeling like it’s something gross. Because that’s I think that’s still something that a lot of people feel when they talk about their periods or when they are confronted with their periods or menstrual blood basically. [12:37] find out more about your body and what the what it does and be more involved in it basically which makes you feel more empowered and that which kind of erases that feeling of shame that that somehow society kind of puts upon you when it comes to your period and menstrual blood in general. And that it should be something that should be hidden away it should be something you throw away and it’s not something to look at to think about. I think I mean it happens to almost all women and on a regular basis and yeah I can see how that could be a really empowering. And we also you have a pattern for you yourself have written a pattern for menstrual pads that we have up in the maternity sewing shop right? [13:29] Yeah yeah I do I’ve got kind of an alias like a different shop from Paprika patterns where I sell my women’s patterns. I have a shop on Etsy as well for which I’ve made a couple of different patterns but I also sell one that’s the most versatile I well in the maternity sewing shop. It comes in comes in five sizes so you can choose from extra small to extra large and what I really like about them you can use them for whatever stage that you’re in. 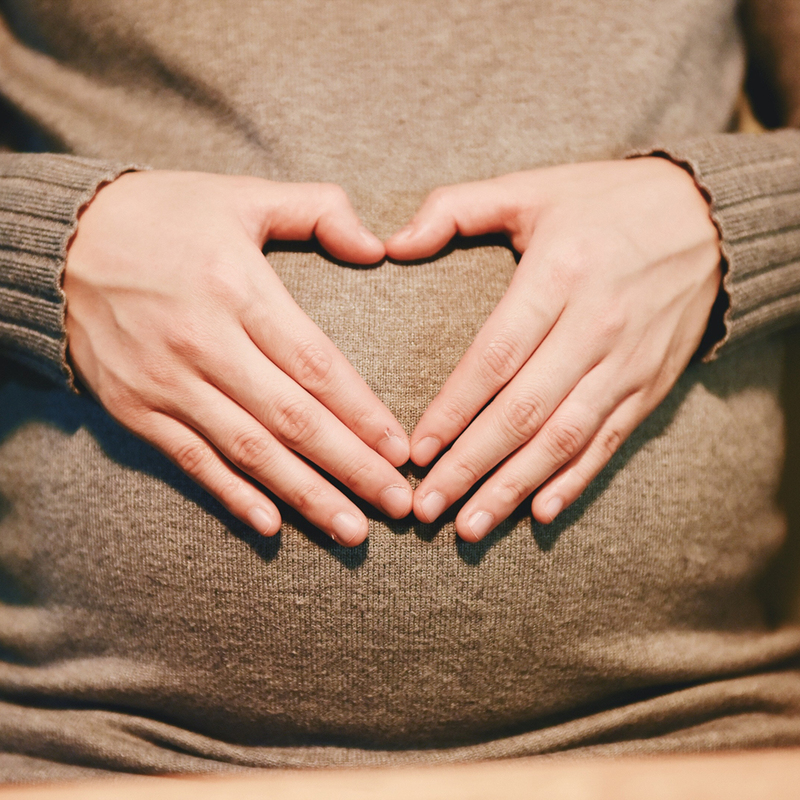 So if you are pregnant, you usually or a symptom of pregnancy could be that you have more vaginal discharge for example and so even though you don’t have a period during that time, it’s still very nice to have some extra layer in your underwear. Also for I’ve also seen women use it for incontinence. I mean we all know that especially after you have a baby this can be kind of an issue and it can linger for a long time. So every time you sneeze you lose a bit of urine. [14:50] Also when when you are pregnant in your in your third trimester for instance and your baby is like with his head on your bladder you know these accidents can happen pretty easily.Well that’s great. So it’s not just for periods, but also basically for all other stages. [15:18] Great. Well we will have a link to that and sources and everything else in our show notes. So make sure you do check those out on maternity sewing.com/podcast. Thanks so much for teaching me something today Lisa. I appreciate it. Yeah, it’s nice to talk about because it’s something that is kind of normal for me now but I know it’s a not for a lot of women. I think if people could get into it, into this idea then they would benefit from it. Thanks, we’ll talk to you later. That’s it for today’s episode of the Maternity Sewing Podcast. You can find maternity sewing at maternitysewing.com. You’ll find our curated pattern shop of maternity, nursing and postpartum friendly sewing patterns, our blog where we have tutorials and inspiration for pregnant, nursing, and postpartum sewists, and the show notes form all our podcasts. I’m Erin Weisbart, your co-host today and co-owner of Maternity Sewing. You can find me at tuesdaystitches.com and on instagram as tuesdaystitches. I’m Lisa Kievits, your co-host today and co-owner of Maternity Sewing. You can find me at paprikapatterns.com and on instagram as paprikapatterns.